The Chronics and Acutes fear the Big Nurse and the fog machine. They complain a lot but in the words of McMurphy, don’t have the guts to walk out, try something different, something that might actually be construed as dangerous, risking AIR RAID sirens going off in their heads. 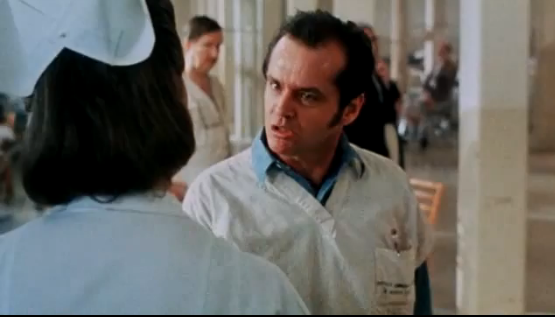 One Flew Over the Cuckoo’s Nest is a great book by Ken Kesey, and a great movie starring Jack Nicholson. Seth Godin’s Domino Project takes on the future of publishing and considers whether ebooks will be the new art form. Digital books will never entirely replace paper any more than television could knock out radio or the Internet can replace television. Ebooks can flourish by being different, and supplementing the physical books by bringing the story, the artistic vision ALIVE, like McMurphy in One Flew Over the Cuckoo’s Nest. Make the AIR RAID sirens go off in the reader’s head.